Designed by an R&D team supervised by Hideki Sato and Masami Ishikawa, the Genesis was adapted from Sega's System 16 arcade board, centered on a Motorola 68000 processor as the CPU, a Zilog Z80 as a sound controller, and a video system supporting hardware sprites, tiles, and scrolling. It plays a library of more than 900 games created by Sega and a wide array of third-party publishers and delivered on ROM-based cartridges. Several add-ons were released, including a Power Base Converter to play Master System games. It was released in several different versions, some created by third parties. Sega created two network services to support the Genesis: Sega Meganet and Sega Channel. In Japan, the Mega Drive fared poorly against its two main competitors, Nintendo's Super Famicom and NEC's PC Engine, but it achieved considerable success in North America, Brazil, and Europe. Contributing to its success were its library of arcade game ports, the popularity of Sega's Sonic the Hedgehog series, several popular sports franchises, and aggressive youth marketing that positioned the system as the cool console for adolescents. The release of the Super Nintendo Entertainment System two years after the Genesis resulted in a fierce battle for market share in the United States and Europe that has often been termed as a "console war" by journalists and historians. As this contest drew increasing attention to the video game industry among the general public, the Genesis and several of its highest-profile games attracted significant legal scrutiny on matters involving reverse engineering and video game violence. Controversy surrounding violent games such as Night Trap and Mortal Kombat led Sega to create the Videogame Rating Council, a predecessor to the Entertainment Software Rating Board. 30.75 million first-party Genesis units were sold worldwide. In addition, Tec Toy sold an estimated three million licensed variants in Brazil, Majesco projected it would sell 1.5 million licensed variants of the system in the United States, and much smaller numbers were sold by Samsung in South Korea. By the mid-2010s, licensed third-party Genesis rereleases were still being sold by AtGames in North America and Europe. Many games have been rereleased in compilations or on online services such as the Nintendo Virtual Console, Xbox Live Arcade, PlayStation Network, and Steam. The Genesis was succeeded in 1994 by the Sega Saturn. In the early 1980s, Sega Enterprises, Inc., then a subsidiary of Gulf & Western, was one of the top five arcade game manufacturers active in the United States, as company revenues surpassed $200 million between July 1981 and June 1982. A downturn in the arcade business starting in 1982 seriously hurt the company, leading Gulf & Western to sell its North American arcade manufacturing organization and the licensing rights for its arcade games to Bally Manufacturing. The company retained Sega's North American R&D operation, as well as its Japanese subsidiary, Sega Enterprises, Ltd. With its arcade business in decline, Sega Enterprises, Ltd. president Hayao Nakayama advocated that the company leverage its hardware expertise to move into the home console market in Japan, which was in its infancy at the time. Nakayama received permission to proceed with this project, leading to the release of Sega's first home video game system, the SG-1000, in July 1983. The SG-1000 was not successful; while it had sold 160,000 units in Japan, far greater than any of Sega's arcade platforms, sales at stores were dominated by Nintendo's Famicom which had been released the same day. Sega estimated that the Family Computer outsold the SG-1000 by a 10-to-1 margin. The SG-1000 was replaced by the Sega Mark III within two years. In the meantime, Gulf & Western began to divest itself of its non-core businesses after the death of company founder Charles Bluhdorn, so Nakayama and former Sega CEO David Rosen arranged a management buyout of the Japanese subsidiary in 1984 with financial backing from CSK Corporation, a prominent Japanese software company. Nakayama was then installed as CEO of the new Sega Enterprises, Ltd. In 1986, Sega redesigned the Mark III for release in North America as the Sega Master System. This was followed by a European release the next year. Although the Master System was a success in Europe, and later in Brazil, it failed to ignite significant interest in the Japanese or North American markets, which, by the mid-to-late 1980s, were both dominated by Nintendo. With Sega continuing to have difficulty penetrating the home market, Sega's console R&D team, led by Masami Ishikawa and supervised by Hideki Sato, began work on a successor to the Master System almost immediately after that console launched. In 1987, Sega faced another threat to its console business when Japanese computer giant NEC released the PC Engine amid great publicity. To remain competitive against the two more established consumer electronics companies, Ishikawa and his team decided they needed to incorporate a 16-bit microprocessor into their new system to make an impact in the marketplace and once again turned to Sega's strengths in the arcade industry to adapt the successful Sega System 16 arcade board into architecture for a home console. The decision to use a Motorola 68000 as the system's main CPU was made late in development, while a Zilog Z80 was used as a secondary CPU to handle the sound due to fears that the load to the main CPU would be too great if it handled both the visuals and the audio. The 68000 chip was expensive and would have driven the retail price of the console up greatly, but Sega was able to negotiate a sale with a distributor for obtaining the chips for a tenth of their price on an up-front volume sale with the promise of potentially more if the console was successful. Sega announced a North American release date for the system on January 9, 1989. At the time, Sega did not possess a North American sales and marketing organization and was distributing its Master System through Tonka. Dissatisfied with Tonka's performance, Sega looked for a new partner to market the Genesis in North America and offered the rights to Atari Corporation, which did not yet have a 16-bit system. David Rosen made the proposal to Atari CEO Jack Tramiel and the president of Atari's Entertainment Electronics Division, Michael Katz. Tramiel declined to acquire the new console, deeming it too expensive, and instead opted to focus on the Atari ST. Sega decided to launch the console through its own Sega of America subsidiary, which executed a limited launch on August 14, 1989, in New York City and Los Angeles. The Sega Genesis was released in the rest of North America later that year. The European version was released in September 1990, at a price of GB₤189.99. The release was handled by Virgin Mastertronic, which was later purchased by Sega in 1991 and became Sega of Europe. Games like Space Harrier II, Ghouls 'n Ghosts, Golden Axe, Super Thunder Blade, and The Revenge of Shinobi were available in stores at launch. The console was also bundled with Altered Beast. The Mega Drive and its first batch of games were shown at the 1990 European Computer Entertainment Show (ECES) in Earl's Court. Between July and August 1990, Virgin initially placed their order for 20,000 Mega Drive units. However, the company increased the order by 10,000 units when advanced orders had exceeded expectations, and another 10,000 units was later added following the console's success at the ECES event. The projected number of units to be sold between September and December 1990 had eventually increased to 40,000 units in the United Kingdom alone. Other companies assisted in distributing the console to various countries worldwide. Ozisoft handled the Mega Drive's launch and marketing in Australia, as it had done before with the Master System. In Brazil, the Mega Drive was released by Tectoy in 1990, only a year after the Brazilian release of the Master System. Tec Toy produced games exclusively for the Brazilian market and began a network service for the system called Sega Meganet in 1995. In India, Sega entered a distribution deal with Shaw Wallace in the spring of 1995 in order to circumvent an 80% import tariff, with each unit selling for INR₹18,000. Samsung handled sales and distribution in Korea, where it was renamed the "Super Gam*Boy" and retained the Mega Drive logo alongside the Samsung name. It was later renamed "Super Aladdin Boy". In mid-1990, Nakayama hired Tom Kalinske to replace Katz as CEO of Sega of America. Although Kalinske initially knew little about the video game market, he surrounded himself with industry-savvy advisors. A believer in the razor and blades business model, he developed a four-point plan: cut the price of the console, create a U.S.-based team to develop games targeted at the American market, continue and expand the aggressive advertising campaigns, and replace the bundled game Altered Beast with a new game, Sonic the Hedgehog. The Japanese board of directors initially disapproved of the plan, but all four points were approved by Nakayama, who told Kalinske, "I hired you to make the decisions for Europe and the Americas, so go ahead and do it." Magazines praised Sonic as one of the greatest games yet made, and Sega's console finally took off as customers who had been waiting for the release of the international version of Nintendo's Super Famicom—the Super Nintendo Entertainment System or SNES—decided to purchase a Genesis instead. Nintendo's console debuted against an established competitor, while NEC's TurboGrafx-16 failed to gain traction, and NEC soon pulled out of the market. In large part due to the popularity of Sonic the Hedgehog, the Sega Genesis outsold the SNES in the United States nearly two to one during the 1991 holiday season. This success led to Sega having control of 65% of the 16-bit console market in January 1992, making it the first time Nintendo was not the console leader since December 1985. To compete with Nintendo, Sega was more open to new types of games than its rival, but still tightly controlled the approval process for third-party games and charged high prices for cartridge manufacturing. Technicians from American third-party video game publisher Electronic Arts (EA) reverse engineered the Genesis in 1989, following nearly one year of negotiations with Sega in which EA requested a more liberal licensing agreement than was standard in the industry before releasing its games for the system. The clean room reverse engineering was led by Steve Hayes and Jim Nitchals, lasting several months before EA secretly began game development. EA founder Trip Hawkins confronted Nakayama with this information one day prior to the 1990 Consumer Electronics Show (CES), noting that EA had the ability to run its own licensing program if Sega refused to meet its demands. Sega relented, and the next day EA's upcoming Genesis games were showcased at CES. EA signed what Hawkins described as "a very unusual and much more enlightened license agreement" with Sega in June 1990: "Among other things, we had the right to make as many titles as we wanted. We could approve our own titles ... the royalty rates were a lot more reasonable. We also had more direct control over manufacturing." After the deal was in place, EA chief creative officer Bing Gordon learned that "we hadn't figured out all the workarounds" and "Sega still had the ability to lock us out," noting "It just would have been a public relations fiasco." EA released its first two Genesis games, Populous and Budokan: The Martial Spirit, within the month. The first Genesis version of EA's John Madden Football arrived before the end of 1990, and became what Gordon called a "killer app" for the system. Taking advantage of the licensing agreement, Gordon and EA's vice president of marketing services Nancy Fong created a visual identifier for EA's Genesis cartridges: A yellow stripe on their left side added during manufacturing. Sega was able to outsell Nintendo four Christmas seasons in a row due to the Genesis' head start, a lower price point, and a larger library of games when compared to the Super Nintendo at its release. Sega had ten games for every game on SNES, and while the SNES had an exclusive version of Final Fight, one of Sega's internal development teams created Streets of Rage, which had bigger levels, tougher enemies, and a well-regarded soundtrack. ASCII Entertainment reported in the spring of 1993 that Genesis had 250 games versus 75 for Super Nintendo, but limited shelf space meant that stores typically offered 100 Genesis and 50 Super Nintendo games. The NES was still the leader, with 300 games and 100 on shelves. Sega's advertising positioned the Genesis as the cooler console, and as its advertising evolved, the company coined the term "blast processing" (the origin of which is an obscure programming trick on the graphics hardware) to suggest that its processing capabilities were far greater than those of the SNES. A Sony focus group found that teenage boys would not admit to owning a SNES rather than a Genesis. With the Genesis often outselling the SNES at a ratio of 2:1, Nintendo and Sega both focused heavily on impression management of the market, even going to the point of deception, with Nintendo claiming it had sold more consoles in 1991 than it actually had, and forecasting it would sell 6 million consoles by the end of 1992, while its actual U.S. install base at the end of 1992 was only just more than 4 million units. Due to these tactics, it was difficult to ascertain a clear leader in market share for several years at a time, with Nintendo's dollar share of the U.S. 16-bit market dipping down from 60% at the end of 1992 to 37% at the end of 1993, Sega claiming 55% of all 16-bit hardware sales during 1994, and Donkey Kong Country helping the SNES to outsell the Genesis from 1995 through 1997. According to a 2004 study of NPD sales data, the Sega Genesis was able to maintain its lead over the Super NES in the American 16-bit console market. However, according to a 2014 Wedbush Securities report based on revised NPD sales data, the SNES outsold the Genesis in the U.S. market. While Sega was seeking a flagship series to compete with Nintendo's Mario series along with a character to serve as a company mascot, several character designs were submitted as part of a company-wide contest, including "an anime-inspired egg and a teal hedgehog with red shoes created by Naoto Ohshima that he called Mr. Needlemouse." This character won the contest and was renamed Sonic the Hedgehog, spawning one of the best-selling video game franchises in history. The gameplay of Sonic the Hedgehog originated with a tech demo created by Yuji Naka, who had developed an algorithm that allowed a sprite to move smoothly on a curve by determining its position with a dot matrix. Naka's original prototype was a platform game that involved a fast-moving character rolling in a ball through a long winding tube, and this concept was subsequently fleshed out with Ohshima's character design and levels conceived by designer Hirokazu Yasuhara. Sonic's blue pigmentation was chosen to match Sega's cobalt blue logo, and his shoes were a concept evolved from a design inspired by Michael Jackson's boots with the addition of the color red, which was inspired by both Santa Claus and the contrast of those colors on Jackson's 1987 album Bad; his personality was based on Bill Clinton's "can do" attitude. Although Katz and Sega of America's marketing experts disliked the idea of Sonic, certain that it would not catch on with most American kids, Kalinske's strategy to place Sonic the Hedgehog as the pack-in game paid off. 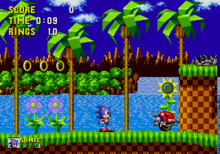 Featuring speedy gameplay, Sonic the Hedgehog greatly increased the popularity of the Sega Genesis in North America. Bundling Sonic the Hedgehog with the Sega Genesis is credited with helping Sega gain 65% of the market share against Nintendo. As a result of piracy in some countries and unlicensed development issues, Sega incorporated a technical protection mechanism into a new edition of the Genesis released in 1990, referred to as the Genesis III. This new variation of the Genesis included a code known as the Trademark Security System (TMSS), which, when a game cartridge was inserted, would check for the presence of the string "SEGA" at a particular point in the memory contained in the cartridge. If the string was present, the console would run the game, and would briefly display the message: "Produced by or under license from Sega Enterprises, Ltd." This system had a twofold effect: it added extra protection against unlicensed developers and software piracy, and forced the Sega trademark to display when the game was powered up, making a lawsuit for trademark infringement possible if unlicensed software were to be developed. Accolade learned of this development at the Winter Consumer Electronics Show in January 1991, where Sega showed the new Genesis III and demonstrated it screening and rejecting an Ishido game cartridge. With more games planned for the following year, Accolade successfully identified the TMSS file. It later added this file to the games HardBall!, Star Control, Mike Ditka Power Football, and Turrican. In response to the creation of these unlicensed games, Sega filed suit against Accolade in the United States District Court for the Northern District of California, on charges of trademark infringement, unfair competition, and copyright infringement. In response, Accolade filed a counterclaim for falsifying the source of its games by displaying the Sega trademark when the game was powered up. Although the district court initially ruled for Sega and issued an injunction preventing Accolade from continuing to reverse engineer the Genesis, Accolade appealed the verdict to the United States Court of Appeals for the Ninth Circuit. In 1993, the American media began to focus on the mature content of certain video games. Games such as Night Trap for the Sega CD, an add-on, received unprecedented scrutiny. Issues about Night Trap were brought up in the United Kingdom, with former Sega of Europe development director Mike Brogan noting that "Night Trap got Sega an awful lot of publicity ... it was also cited in UK Parliament for being classified as "15" due to its use of real actors." This came at a time when Sega was capitalizing on its image as an edgy company with attitude, and this only reinforced that image. By far the year's most controversial game was Midway's Mortal Kombat, ported to the Genesis and SNES by Acclaim Entertainment. In response to public outcry over the game's graphic violence, Nintendo decided to replace the blood in the game with "sweat" and the arcade's gruesome "fatalities" with less violent finishing moves. Sega took a different approach, instituting America's first video game ratings system, the Videogame Rating Council (VRC), for all its current systems. Ratings ranged from the family friendly GA rating to the more mature rating of MA-13, and the adults-only rating of MA-17. With the rating system in place, Sega released its version of Mortal Kombat, appearing to have removed all the blood and sweat effects and toning down the finishing moves even more than in the SNES version. However, all the arcade's blood and uncensored finishing moves could be enabled by entering a "Blood Code". This technicality allowed Sega to release the game with a relatively low MA-13 rating. Meanwhile, the tamer SNES version shipped without a rating. Furthermore, I can't let you sit here and buy this nonsense that this Sega Night Trap game was somehow only meant for adults. The fact of the matter is this is a copy of the packaging. There was no rating on this game at all when the game was introduced. Small children bought this at Toys "R" Us, and he knows that as well as I do. When they started getting heat about this game, then they adopted the rating system and put ratings on it. In response, Sega of America vice president Bill White showed a videotape of violent video games on the SNES and stressed the importance of rating video games. At the end of the hearing, Lieberman called for another hearing in February 1994 to check on progress toward a rating system for video game violence. In order to extend the life of the Genesis, Sega released two add-ons to increase its capabilities: a CD-based peripheral known as the Sega CD (Mega-CD outside North America), and a 32-bit peripheral known as the Sega 32X. 2.24 million Sega CD units were sold worldwide, and an estimated 665,000 32X units were sold by the end of 1994. Following the launch of the next-generation 32-bit Sony PlayStation and Sega Saturn, sales of 16-bit hardware and software continued to account for 64% of the video game market in 1995. Sega underestimated the continued popularity of the Genesis and did not have the inventory to meet demand for the product. Sega was able to capture 43% of the dollar share of the U.S. video game market and claimed to have sold more than 2 million Genesis units in 1995, while Genesis software such as Vectorman remained highly successful, but Kalinske estimated that "we could have sold another 300,000 Genesis systems in the November/December timeframe." Nakayama's decision to focus on the Saturn over the Genesis, based on the systems' relative performance in Japan, has been cited as the major contributing factor in this miscalculation. By contrast, Nintendo concentrated on the 16-bit home console market, as well as its successful handheld, the Game Boy. As a result, Nintendo took in 42% of the video game market dollar share, without launching a 32-bit console to compete directly with the PlayStation or the Saturn. Following tensions with Sega Enterprises, Ltd. over its focus on the Saturn, Kalinske, who oversaw the rise of the Genesis in 1991, grew uninterested in the business and resigned in mid-1996. Sega sold 30.75 million Genesis units worldwide. Of these, 3.58 million were sold in Japan, and sales in Europe and the U.S. are roughly estimated at 8 million and 18–18.5 million as of June 1997 (at which time Sega was no longer manufacturing the system) respectively. In 1998, Sega licensed the Genesis to Majesco Entertainment in North America so it could re-release the console. Majesco began reselling millions of formerly unsold cartridges at a budget price, together with 150,000 units of the second model of the Genesis. It released the Sega Genesis 3, projecting to sell 1.5 million units of the console by the end of 1998. An estimated 3 million Genesis units were sold by Tec Toy in Brazil. The main microprocessor is a 16/32-bit Motorola 68000 CPU clocked at 7.6 MHz. The console uses a Zilog Z80 sub-processor, mainly used to control the sound hardware and provide backward compatibility with the Master System. The system has 72 kB of RAM, 64 kB of video RAM, and can display up to 61 colors at once from a palette of 512. The games are in ROM cartridge format and inserted in the top. The system produces sound using a Yamaha YM2612 FM synthesizer and a Texas Instruments SN76489 PSG; the latter is integrated with the Video Display Processor (VDP). The Z80 processor is primarily used to control both sound chips to produce stereo music and sound effects. Most revisions of the original system contain a discrete YM2612 and a separate YM7101 VDP; the functionality of these two chips was later integrated into a single custom ASIC (FC1004) for the model 2 and later revisions. The system is backward compatible with the Master System. The first peripheral released, the Power Base Converter (Master System Converter in Europe), allows Master System games to be played. A second model, the Master System Converter 2, was released only in Europe for use with the Mega Drive II. Other peripherals were released to add functionality. The Menacer is a wireless, infrared light gun peripheral used with compatible games. Other third parties created light gun peripherals for the Genesis, such as the American Laser Games Pistol and the Konami Justifier. Released for art creation software, the Sega Mega Mouse features three buttons and is only compatible with a few games, such as Eye of the Beholder. A foam-covered bat called the BatterUP and the TeeVGolf golf club were released for both the Genesis and SNES. In November 1993, Sega released the Sega Activator, an octagonal device that lies flat on the floor and was designed to translate the player's physical movements into game inputs. Several high-profile games, including Mortal Kombat and Street Fighter II: Special Champion Edition, were adapted to support the peripheral. The device was a commercial failure, due mainly to its inaccuracy and its high price point. IGN editor Craig Harris ranked the Sega Activator the third worst video game controller ever made. Both EA and Sega released multitaps to allow more than the standard two players to play at once. Initially, EA's version, the 4 Way Play, and Sega's adapter, the Team Player, only supported each publisher's games. In response to complaints about this, Sega publicly stated, "We have been working hard to resolve this problem since we learned of it", and that a new Team Player which would work with all multitap games for the console would be released shortly. Later games were created to work on both the 4 Way Play and Team Player. Codemasters also developed the J-Cart system, providing two extra ports on the cartridge itself, although the technology came late in the console's life and is only featured on a few games. Sega planned to release a steering wheel peripheral in 1994, and the Genesis version of Virtua Racing was advertised as being "steering wheel compatible," but the peripheral was cancelled. In 1994, Sega started the Sega Channel, a game distribution system using cable television services Time Warner Cable and TCI. Using a special peripheral, Genesis players could download a game from a library of fifty each month and demos for upcoming releases. Games were downloaded to internal memory and deleted when the console was powered off. The Sega Channel reached 250,000 subscribers at its peak and ran until July 31, 1998, well past the release of the Sega Saturn. In an effort to compete with Sega, third-party developer Catapult Entertainment created the XBAND, a peripheral which allowed Genesis players to engage in online competitive gaming. Using telephone services to share data, XBAND was initially offered in five U.S. cities in November 1994. The following year, the service was extended to the SNES, and Catapult teamed up with Blockbuster Video to market the service, but as interest in the service waned, it was discontinued in April 1997. Initially, the Genesis suffered from limited third-party support due to its low market share and Nintendo's monopolizing practices. Notably, the arcade hit Street Fighter II by Capcom initially skipped the Genesis, instead only being released on the SNES. However, as the Genesis continued to grow in popularity, Capcom eventually ported a version of Street Fighter II to the system known as Street Fighter II: Champion Edition, that would go on to sell over a million copies. One of the biggest third-party companies to support the Genesis early on was Electronic Arts. Trip Hawkins, founder and then president of EA, believed the Genesis faster drawing speed made it more suitable for sport games than the SNES, and credits EA's success on the Genesis for helping catapult the EA Sports brand. Another third-party blockbuster for the system was the port of the original Mortal Kombat. Although the arcade game was released on the SNES and Genesis simultaneously, the two ports were not identical. The SNES version looked closer to the arcade game, but the Genesis version allowed players to bypass censorship, helping make it more popular. In 1997, Sega of America claimed the Genesis had a software attach rate of 16 games sold per console, double that of the SNES. The graphics produced by the Sega Virtua Processor are comparable to those of Nintendo's Super FX chip. On the Super NES, companies could add enhancement chips to cartridges to increase the console's capabilities and produce more advanced graphics; for example, the launch game Pilotwings contained a digital signal processor. Later, the Super FX chip was designed to offload complex rendering tasks from the main CPU. It was first used in Star Fox, which renders 3D polygons in real time, and Super Mario World 2: Yoshi's Island demonstrates rotation, scaling, and stretching of individual sprites and manipulates large areas of the screen. Sega began work on an enhancement chip to compete with the Super FX, resulting in the Sega Virtua Processor. This chip enables the Genesis to render polygons in real time and provides an "Axis Transformation" unit that handles scaling and rotation. Virtua Racing, the only game released with this chip, runs at a significantly higher and more stable frame rate than similar games on the SNES. The chip was expensive to produce, and increased the cost of the games that used it. At US$100, Virtua Racing was the most expensive Genesis cartridge ever produced. Two other games, Virtua Fighter and Daytona USA, were planned for the SVP chip, but were instead moved into the Saturn's launch line-up. There were plans to sell the SVP chip as a separate upgrade module for the Genesis, but this module was never released. In addition to accessories such as the Power Base Converter, the Sega Genesis supports two add-ons that each support their own game libraries. The first is the Sega CD (known as the Mega-CD in all regions except for North America), a compact disc-based peripheral that can play its library of games in CD-ROM format. The second is the Sega 32X, a 32-bit peripheral which uses ROM cartridges and serves as a pass-through for Genesis games. Sega produced a custom power strip to fit the peripherals' large AC adapters. Both add-ons were officially discontinued in 1996. By 1991, compact discs had gained in popularity as a data storage device for music and software. PCs and video game companies had started to make use of this technology. NEC had been the first to include CD technology in a game console with the release of the TurboGrafx-CD add-on, and Nintendo was making plans to develop its own CD peripheral as well. Seeing the opportunity to gain an advantage over its rivals, Sega partnered with JVC to develop a CD-ROM add-on for the Genesis. Sega launched the Mega-CD in Japan on December 1, 1991, initially retailing at JP¥49,800. The CD add-on was launched in North America on October 15, 1992, as the Sega CD, with a retail price of US$299; it was released in Europe as the Mega-CD in 1993. In addition to greatly expanding the potential size of its games, this add-on unit upgraded the graphics and sound capabilities by adding a second, more powerful processor, more system memory, and hardware-based scaling and rotation similar to that found in Sega's arcade games. It provided battery-backed storage RAM to allow games to save high scores, configuration data, and game progress. The Mega-CD sold only 100,000 units during its first year in Japan, falling well below expectations. Although many consumers blamed the add-on's high launch price, it also suffered from a tiny software library; only two games were available at launch. This was due in part to the long delay before Sega made its software development kit available to third-party developers. Sales were more successful in North America and Europe, although the novelty of FMV and CD-enhanced games quickly wore off as many of the system's later games were met with lukewarm or negative reviews. In 1995, Sega announced a shift in focus to its new console, the Saturn, and discontinued all advertising for Genesis hardware, including the Sega CD. The add-on sold 2.24 million units worldwide. With the release of the Sega Saturn slated for 1995, Sega began to develop a stop-gap solution that would bridge the gap between the Genesis and the Saturn, and would serve as a less expensive entry into the 32-bit era. At the Winter Consumer Electronics Show in January 1994, Sega of America research and development head Joe Miller took a phone call from Nakayama, in which Nakayama stressed the importance of coming up with a quick response to the Atari Jaguar. One potential idea for this came from a concept from Sega Enterprises, later known as "Project Jupiter," an entirely new independent console. Project Jupiter was initially slated to be a new version of the Genesis, with an upgraded color palette and a lower cost than the upcoming Saturn, as well as with some limited 3D capabilities thanks to integration of ideas from the development of the Sega Virtua Processor chip. Miller suggested an alternative strategy, citing concerns with releasing a new console with no previous design specifications within six to nine months. At the suggestion from Miller and his team, Sega designed the 32X as a peripheral for the existing Genesis, expanding its power with two 32-bit SuperH-2 processors. The SH-2 had been developed in 1993 as a joint venture between Sega and Japanese electronics company Hitachi. At the end of the Consumer Electronics show, with the basic design of the 32X in place, Sega Enterprises invited Sega of America to assist in development of the new add-on. Although the new unit was a stronger console than originally proposed, it was not compatible with Saturn games. Before the 32X could be launched, the release date of the Saturn was announced for November 1994 in Japan, coinciding with the 32X's target launch date in North America. Sega of America now was faced with trying to market the 32X with the Saturn's Japan release occurring simultaneously. Their answer was to call the 32X a "transitional device" between the Genesis and the Saturn. This was justified by Sega's statement that both platforms would run at the same time, and that the 32X would be aimed at players who could not afford the more expensive Saturn. The 32X was released in November 1994, in time for the holiday season. Demand among retailers was high, and Sega could not keep up orders for the system. More than 1,000,000 orders had been placed for 32X units, but Sega had only managed to ship 600,000 units by January 1995. Launching at about the same price as a Genesis console, the price of the 32X was less than half of what the Saturn's price would be at launch. Despite the console's positioning as an inexpensive entry into 32-bit gaming, Sega had a difficult time convincing third-party developers to create games for the new system. After an early run on the peripheral, news soon spread to the public of the upcoming release of the Sega Saturn, which would not support the 32X's games. The Saturn was released on May 11, 1995, four months earlier than its originally intended release date of September 2, 1995. The Saturn, in turn, caused developers to further shy away from the console and created doubt about the library for the 32X, even with Sega's assurances that there would be a large number of games developed for the system. In early 1996, Sega conceded that it had promised too much out of the 32X and decided to stop producing the system in order to focus on the Saturn. Prices for the 32X dropped to $99 and cleared out of stores at $19.95. More than a dozen licensed variations of the Sega Genesis/Mega Drive have been released. In addition to models made by Sega, alternate models were made by other companies, such as Majesco Entertainment, AtGames, JVC, Pioneer Corporation, Amstrad, and Aiwa. A number of bootleg clones were created during its lifespan. In 1993, Sega introduced a smaller, lighter version of the console, known as the Mega Drive 2 in Japan, Europe, and Australia[d] and simply sold as Genesis (without the Sega prefix) in North America. This version omits the headphone jack in the front, replaces the A/V-Out connector with a smaller version that supports stereo sound, and provides a simpler, less expensive mainboard that requires less power. Sega released a combined, semi-portable Genesis/Sega CD unit called the Genesis CDX (marketed as the Multi-Mega in Europe). This unit retailed at $399.95 in the U.S. (roughly $100 more than the individual Genesis and Sega CD units put together, since the Sega CD dropped its price to $229 half a year before), and was bundled with Sonic CD, Sega Classics Arcade Collection, and the Sega CD version of Ecco the Dolphin. The CDX features a small LCD screen that, when the unit is used to play audio CDs, displays the current track being played. With this feature and the system's lightweight build (weighing two pounds), Sega marketed it in part as a portable CD player. Late in the 16-bit era, Sega released a handheld version of the Genesis called the Genesis Nomad. Its design was based on the Mega Jet, a Mega Drive portable unit featured on airplane flights in Japan. As the only successor to the Game Gear, the Nomad operates on 6 AA batteries, displaying its graphics on a 3.25-inch (8.25-mm) LCD screen. The Nomad supports the entire Genesis library, but cannot be used with the Sega 32X, the Sega CD, or the Power Base Converter. Exclusive to the Japanese market was the TeraDrive, a Mega Drive combined with an IBM PC compatible computer. 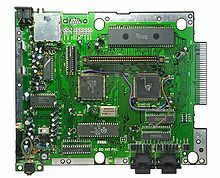 Sega also produced three arcade system boards based on the Mega Drive: the System C-2, the MegaTech, and the MegaPlay, which support approximately 80 games combined. Working with Sega Enterprises, JVC released the Wondermega on April 1, 1992, in Japan. The system was later redesigned by JVC and released as the X'Eye in North America in September 1994. Designed by JVC to be a Genesis and Sega CD combination with high quality audio, the Wondermega's high price ($500 at launch) kept it out of the hands of average consumers. The same was true of the Pioneer LaserActive, which requires an add-on known as the Mega-LD pack, developed by Sega, in order to play Genesis and Sega CD games. Although the LaserActive was lined up to compete with the 3DO Interactive Multiplayer, the combined price of the system and the Mega-LD pack made it a prohibitively expensive option for Sega players. Aiwa released the CSD-GM1, a combination Genesis/Sega CD unit built into a boombox. Several companies added the Mega Drive to personal computers, mimicking the design of Sega's TeraDrive; these include the MSX models AX-330 and AX-990, distributed in Kuwait and Yemen, and the Amstrad Mega PC, distributed in Europe and Australia. After the Genesis was discontinued, Majesco Entertainment released the Genesis 3 as a budget version in 1998. In 2009, AtGames began producing two new variations: the Firecore, which can play original Genesis cartridges as well as preloaded games, and a handheld console preloaded with 20 Genesis games. Companies such as Radica Games have released various compilations of Genesis and Mega Drive games in "plug-and-play" packages resembling the system's controller. A number of Genesis and Mega Drive emulators have been produced, including GenEM, KGen, Genecyst, VGen, St0rm, and Gens. The GameTap subscription gaming service included a Sega Genesis emulator and had several dozen licensed Genesis games in its catalog. The Console Classix subscription gaming service includes an emulator and has several hundred Sega Genesis games in its catalog. Compilations of Sega Genesis games have been released for other consoles. These include Sonic Mega Collection and Sonic Gems Collection for PS2, Xbox, and Nintendo GameCube; Sega Genesis Collection for PS2 and PSP, and Sonic's Ultimate Genesis Collection (known as the Sega Mega Drive Ultimate Collection in PAL territories) for PlayStation 3 and Xbox 360. During his keynote speech at the 2006 Game Developers Conference, Nintendo president Satoru Iwata announced that Sega would make a number of Genesis/Mega Drive games available to download on the Wii's Virtual Console. There are select Sega Genesis games available on the Xbox 360 through Xbox Live Arcade, such as Sonic the Hedgehog and Sonic 2, as well as games available via the PlayStation Network and Steam. On May 22, 2006, North American company Super Fighter Team released Beggar Prince, a game translated from a 1996 Chinese original. It was released worldwide and was the first commercial Genesis game release in North America since 1998. Super Fighter Team would later go on to release two more games for the system, Legend of Wukong and Star Odyssey. In December 2010, WaterMelon, an American company, released Pier Solar and the Great Architects, the first commercial role-playing video game specifically developed for the console since 1996, and the biggest 16-bit game ever produced at 64 Mb. Pier Solar is the only cartridge-based game which can optionally use the Sega CD to play an enhanced soundtrack and sound effects disc. In 2013, independent programmer Future Driver, inspired by the Disney film Wreck-It Ralph, developed Fix-It Felix Jr. for the Genesis. On December 5, 2007, Tec Toy released a portable version of the Genesis/Mega Drive with twenty built-in games. Another version called "Mega Drive Guitar Idol" comes with two six-button joypads and a guitar controller with five fret buttons. The Guitar Idol game contains a mix of Brazilian and international songs. The console has 87 built-in games, including some from Electronic Arts based on the mobile phone versions. In 2009, Chinese company AtGames produced a Genesis/Mega Drive-compatible console, the Firecore. It features a top-loading cartridge slot and includes two controllers similar to the six-button controller for the original Genesis. The console has 15 games built-in and is region-free, allowing cartridge games to run regardless of their region. AtGames produced a handheld version of the console. Both machines have been released in Europe by distributing company Blaze Europe. It was announced that TecToy has developed a new Genesis console that not only looks almost identical to the original model of the Sega Genesis known as the Genesis III, but also has a traditional cartridge slot and SD card reader which will be released in June 2017. In 2018, Sega announced a microconsole, the Genesis/Mega Drive Mini. It will include 40 games, including Gunstar Heroes and Castlevania: Bloodlines, with different games for different regions and a save-anywhere function. Streets of Rage composer Yuzo Koshiro will provide the menu music. The console is planned for release in September 19. The Sega Genesis has often ranked among the best video game consoles. In 2009, IGN named it the fifth best video game console, citing its edge in sports games and better home version of Mortal Kombat, and lauding "what some consider to be the greatest controller ever created: the six button." In 2007, GameTrailers named the Sega Genesis as the sixth best console of all time in their list of top ten consoles that "left their mark on the history of gaming," noting its great games and solid controller, and writing of the "glory days" of Sonic the Hedgehog. In January 2008, technology columnist Don Reisinger proclaimed that the Sega Genesis "created the industry's best console war to date," citing Sonic the Hedgehog, superior sports games, and backward compatibility with the Sega Master System. GamingExcellence also gave the Sega Genesis sixth place in 2008, declaring, "one can truly see the Genesis for the gaming milestone it was." At the same time, GameDaily rated it ninth of ten for its memorable games. In 2014, USgamer's Jeremy Parish wrote, "If the Atari generation introduced video games as a short-lived '70s fad ... and the NES generation established it into an enduring obsession for the young, Sega's Genesis began pushing the medium toward something resembling its contemporary form," expounding that the system served as "the key incubator for modern sports franchises," made "consoles truly international" by providing Western third-parties previously put at a disadvantage by Nintendo's restrictive licensing policies with a more profitable alternative, created "an online subscription service" that foreshadowed "PlayStation Plus more than 15 years early" with the Sega Channel, and "played a key role in ensuring the vitality and future of the games industry by breaking Nintendo's near-monopolistic hold on the U.S. and awakening the U.K. to the merits of television gaming." For his part, Kalinske highlighted Sega's role in developing games for an older demographic and pioneering "the concept of the 'street date'" with the simultaneous North American and European release of Sonic the Hedgehog 2. John Sczepaniak of Retro Gamer noted, "It was a system where the allure was born not only of the hardware and games, but the magazines, playground arguments, climate, and politics of the time." Sega of America's marketing campaign for the Genesis was widely emulated, influencing marketing in the subsequent generation of consoles. Wikimedia Commons has media related to Sega Mega Drive. ^ Japanese: メガドライブ, Hepburn: Mega Doraibu? ^ Spelled as Mega Drive II (with a Roman numeral) in the PAL region. ^ a b c Sonic the Hedgehog GameTap Retrospective Pt. 3/4. GameTap. February 17, 2009. Event occurs at 1:25. Archived from the original on July 21, 2016. Retrieved September 24, 2011. cf. "Review: Sonic Jam". Sega Saturn Magazine. No. 22. August 1997. p. 68. The original Megadrive game sold over 14 million copies. ^ a b Fahs, Travis (April 21, 2009). "IGN Presents the History of Sega (page 5)". IGN. Archived from the original on March 22, 2016. Retrieved October 5, 2013. ^ a b c d e f Kent, Steven L. (2001). "The War". The Ultimate History of Video Games: The Story Behind the Craze that Touched our Lives and Changed the World. Roseville, California: Prima Publishing. ISBN 0-7615-3643-4. ^ Brandt, Richard; Gross, Neil (February 21, 1994). "Sega!". Businessweek. Bloomberg L.P. Archived from the original on December 3, 2013. Retrieved October 10, 2013. ^ Pollack, Andrew (October 24, 1982). "What's New In Video Games; Taking the Zing Out of the Arcade Boom". New York Times. Archived from the original on December 19, 2013. Retrieved November 27, 2013. ^ "The Bottom Line". Miami Herald – via NewsBank (subscription required). August 27, 1983. Archived from the original on November 10, 2013. Retrieved October 10, 2013. ^ a b Sato (November 5, 2018). "Former Sega President Talks About Making The Mega Drive To "Beat Nintendo"". Siliconera. Archived from the original on November 6, 2018. Retrieved November 5, 2018. ^ Kohler, Chris (October 2, 2009). "Playing the SG-1000, Sega's First Game Machine". Wired Magazine's online site. Archived from the original on January 1, 2014. Retrieved October 5, 2009. ^ "G&W Wins Cheers $1 Billion Spinoff Set". Miami Herald – via NewsBank (subscription required). August 16, 1983. Archived from the original on November 10, 2013. Retrieved October 10, 2013. ^ Kent, Steven L. (2001). The Ultimate History of Video Games: The Story Behind the Craze that Touched our Lives and Changed the World. Roseville, California: Prima Publishing. pp. 303, 360. ISBN 0-7615-3643-4. ^ Nintendo Official Magazine Staff (2001). Nintendo Official Magazine - Nintendo's Market Share 1988. London: EMAP. p. 35. ^ Businessweek staff (1999). Businessweek - Nintendo's Market Share 1990. New York: Bloomberg L.P. p. 60. ^ "How Sega Built the Genesis". Polygon. Vox Media. February 3, 2015. Archived from the original on November 3, 2015. Retrieved November 23, 2015. ^ Harris, Blake J. (2014). Console Wars: Sega, Nintendo, and the Battle That Defined a Generation. New York, New York: HarperCollins. p. 386. ISBN 978-0-06-227669-8. ^ a b c Sato (September 18, 2013). "Sega's Original Hardware Developer Talks About The Company's Past Consoles". Siliconera. Curse, Inc. Archived from the original on December 2, 2013. Retrieved November 23, 2013. ^ a b c Fahs, Travis (April 21, 2009). "IGN Presents the History of Sega (page 4)". IGN. Ziff Davis. Archived from the original on February 21, 2014. Retrieved October 5, 2013. ^ a b c d e f g h i j k l m n Sczepaniak, John (August 2006). "Retroinspection: Mega Drive". Retro Gamer. No. 27. Imagine Publishing. pp. 42–47. Archived from the original on September 24, 2015 – via Sega-16. ^ a b McFerran, Damien (February 22, 2012). "The Rise and Fall of Sega Enterprises". Eurogamer. Gamer Network. Archived from the original on February 16, 2014. Retrieved October 5, 2013. ^ Kent, Steven L. (2001). The Ultimate History of Video Games: The Story Behind the Craze that Touched our Lives and Changed the World. Roseville, California: Prima Publishing. p. 447. ISBN 0-7615-3643-4. ^ Sheff, David (1993). Game Over: How Nintendo Zapped an American Industry, Captured Your Dollars, and Enslaved Your Children. New York: Random House. p. 352. ISBN 0-679-40469-4. ^ Kent, Steven L. (2001). The Ultimate History of Video Games. Roseville, California: Prima Publishing. pp. 404–405. ISBN 0-7615-3643-4. ^ a b "News: Megadrive - Official at Last". Computer and Video Games. No. 106. United Kingdom: Future Publishing. September 1990. p. 13. Archived from the original on October 7, 2016. ^ a b "Going Console Crazy". ACE. No. 37. United Kingdom: EMAP Images. October 1990. p. 7. ^ Horowitz, Ken (September 17, 2008). "Interview: Nick Alexander". Sega-16. Ken Horowitz. Archived from the original on March 4, 2016. Retrieved November 27, 2013. ^ "News: See Sega". Computer and Video Games. No. 108. United Kingdom: Future Publishing. November 1990. p. 9. Archived from the original on October 9, 2017. ^ "Even More Mega Drives!". Sega Power. No. 13. United Kingdom: Future Publishing. September 1990. p. 5. ^ Budmar, Patrick (November 23, 2011). "Sega interview: Ozisoft national sales and marketing manager, Tim Allison". PCWorld Australia. IDG. Archived from the original on December 2, 2013. Retrieved November 27, 2013. ^ "Tectoy History" (in Portuguese). Tectoy. Archived from the original on March 23, 2012. Retrieved September 19, 2011. ^ Sczepaniak, John (November 2006). "Company Profile: Tectoy". Retro Gamer. No. 30. Imagine Publishing. pp. 50–53. ^ Zachariah, Reeba. "Game for success Archived April 30, 2013, at the Wayback Machine." The Times of India. August 19, 2011. Retrieved on November 2, 2011. "At that point Sega was being distributed by Shaw Wallace Electronics, owned by the late liquor baron Manu Chhabria. The products were being sold at Rs 18,000." ^ "Screen digest Archived September 12, 2016, at the Wayback Machine." Screen Digest Ltd., 1995. Retrieved from Google Books on November 2, 2011. "Sega tackles Indian market with local maker From spring 1995, Sega will start manufacturing video games consoles in India with local partner Shaw Wallace. Move will circumvent 80 per cent import tariff on games units which currently ..."
^ "Super Gam*Boy" (in Korean). Gamer'Z Magazine. December 2009. p. 181. ^ "Super Aladdin Boy" (in Korean). Game Champ Magazine. December 1992. p. 25. ^ Kent, Steven L. (2001). The Ultimate History of Video Games: The Story Behind the Craze that Touched our Lives and Changed the World. Roseville, California: Prima Publishing. p. 405. ISBN 0-7615-3643-4. ^ Kent, Steven L. (2001). The Ultimate History of Video Games: The Story Behind the Craze that Touched our Lives and Changed the World. Roseville, California: Prima Publishing. pp. 406–408. ISBN 0-7615-3643-4. ^ a b c Kent, Steven L. (2001). The Ultimate History of Video Games: The Story Behind the Craze that Touched our Lives and Changed the World. Roseville, California: Prima Publishing. pp. 424–431. ISBN 0-7615-3643-4. ^ Kent, Steven L. (2001). The Ultimate History of Video Games: The Story Behind the Craze that Touched our Lives and Changed the World. Roseville, California: Prima Publishing. p. 428. ISBN 0-7615-3643-4. ^ Kent, Steven L. (2001). The Ultimate History of Video Games: The Story Behind the Craze that Touched our Lives and Changed the World. Roseville, California: Prima Publishing. pp. 433, 449. ISBN 0-7615-3643-4. ^ "This Month in Gaming History". Game Informer. Vol. 12 no. 105. GameStop. January 2002. p. 117. ^ Reeder, Sara (November 1992). "Why Edutainment Doesn't Make It In A Videogame World". Computer Gaming World. p. 128. Archived from the original on July 2, 2014. Retrieved July 5, 2014. ^ a b c d Kent, Steven L. (2001). The Ultimate History of Video Games: The Story Behind the Craze that Touched our Lives and Changed the World. Roseville, California: Prima Publishing. pp. 408–410. ISBN 0-7615-3643-4. ^ a b c d e f Bertz, Matt (July 2011). "Reverse Engineering Success". Game Informer. Vol. 21 no. 219. GameStop. pp. 96–99. ^ a b Kent, Steven L. (2001). The Ultimate History of Video Games: The Story Behind the Craze that Touched our Lives and Changed the World. Roseville, California: Prima Publishing. pp. 496–497. ISBN 0-7615-3643-4. The late November release of Donkey Kong Country stood in stark contrast to the gloom and doom faced by the rest of the video game industry. After three holiday seasons of coming in second to Sega, Nintendo had the biggest game of the year. Sega still outperformed Nintendo in overall holiday sales, but the 500,000 copies of Donkey Kong Country that Nintendo sent out in its initial shipment were mostly sold in preorder, and the rest sold out in less than one week. It (Donkey Kong Country) established the Super NES as the better 16-bit console and paved the way for Nintendo to win the waning years of the 16-bit generation. ^ a b c Kent, Steven L. (2001). The Ultimate History of Video Games: The Story Behind the Craze that Touched our Lives and Changed the World. Roseville, California: Prima Publishing. pp. 434, 448–449. ISBN 0-7615-3643-4. ^ Wilson, Johnny L. (June 1993). "The Software Publishing Association Spring Symposium 1993". Computer Gaming World. p. 96. Archived from the original on July 2, 2014. Retrieved July 7, 2014. ^ Damien McFerran. "Retroinspection: Mega-CD". Retro Gamer. Vol. 61. London, UK: Imagine Publishing. p. 84. During the run-up to the Western launch of Mega-CD ... [Former Sega of America technical director Scot Bayless] mentioned the fact that you could just 'blast data into the DACs'. [The PR guys] loved the word 'blast' and the next thing I knew 'Blast Processing' was born." ^ a b Kennedy, Sam. "The Essential 50 Part 28 - Sonic the Hedgehog from 1UP.com". 1UP.com. Ziff Davis. Archived from the original on July 14, 2016. Retrieved December 11, 2016. ^ Kent, Steven L. (2001). The Ultimate History of Video Games: The Story Behind the Craze that Touched our Lives and Changed the World. Roseville, California: Prima Publishing. p. 449. ISBN 0-7615-3643-4. ^ CVG Staff (April 14, 2013). "History Lesson: Sega Mega Drive". CVG. Archived from the original on October 14, 2013. Retrieved October 10, 2013. Granted, the Mega Drive wasn't met with quite the same levels of enthusiasm in Japan, but in the US and Europe the Mega Drive often outsold the SNES at a ratio of 2:1. ^ Schilling, Melissa A. (2006). Strategic management of technological innovation. Indiana University: McGraw-Hill/Irwin. p. 292. ISBN 978-0-07-321058-2. Archived from the original on September 11, 2016. ^ Gross, Neil (February 21, 1994). "Nintendo's Yamauchi: No More Playing Around". Business Week. Archived from the original on November 19, 2012. Retrieved December 4, 2013. His first priority is fixing the disaster in the U.S. market, where Nintendo's share of the 16-bit machine business plummeted from 60% at the end of 1992 to 37% a year later, according to Goldman, Sachs & Co.
^ a b "Sega tops holiday, yearly sales projections; Sega Saturn installed base reaches 1.6 million in U.S., 7 million worldwide". Business Wire. January 13, 1997. Archived from the original on April 11, 2013. Retrieved October 13, 2013. Sega hit its projections on the mark, selling 1.1 million hardware units and 3 million Sega Genesis games. While the company recently announced it will dispose of all remaining 16-bit peripheral inventory, specifically the Genesis 32X and Sega CD products, it will continue to sell Genesis hardware and software in the coming years. ^ a b c d "Sega farms out Genesis". Consumer Electronics. March 2, 1998. Archived from the original on July 9, 2012. ^ Clements, Matthew T.; Ohashi, Hiroshi (October 2004). "Indirect Network Effects and the Product Cycle: Video Games in the U.S., 1994–2002" (PDF). NET Institute. pp. 12, 24. Archived (PDF) from the original on September 14, 2014. Retrieved September 21, 2011. ^ a b Pachter, Michael; McKay, Nick; Citrin, Nick (February 11, 2014). "Post Hoc Ergo Propter Hoc; Why the Next Generation Will Be as Big as Ever". Wedbush Equity Research. p. 36. Archived from the original on March 4, 2016. Retrieved November 9, 2015. ^ Harris 2014, p. 63. ^ Harris 2014, pp. 63, 73, 76. ^ Smith, Jamin (June 23, 2011). "Sonic the Hedgehog celebrates his 20th birthday". VideoGamer.com. Archived from the original on November 17, 2015. Retrieved November 17, 2015. To date, the combined series has sold over 80 million units. cf. "Annual Report 2014" (PDF). Sega Sammy Holdings. April 2014. pp. 32–33. Archived (PDF) from the original on September 24, 2015. Retrieved November 9, 2015. cf. North, Dale (June 8, 2015). "Sonic thrives on mobile: 100M Dash downloads, 14M monthly players". VentureBeat. Archived from the original on November 27, 2015. Retrieved November 17, 2015. Sega confirmed today that its mobile runner Sonic Dash has zoomed past the 100 million downloads mark. cf. "Annual Report 2015" (PDF). Sega Sammy Holdings. April 2015. p. 29. Archived (PDF) from the original on November 17, 2015. Retrieved November 17, 2015. ^ "Sonic's Architect: GI Interviews Hirokazu Yasuhara". Game Informer. Vol. 13 no. 124. August 2003. pp. 114–116. ^ Retro Gamer staff (2013). "Sonic Boom: The Success Story of Sonic the Hedgehog". Retro Gamer — The Mega Drive Book. London, UK: Imagine Publishing. p. 31. Designed primarily to appeal to an American audience, he also featured the colors white and red, though Oshima puts this down to coincidence, citing Santa Claus's color scheme and the belt across Michael Jackson's jacket on the cover to Bad as the inspiration for Sonic's shoes. Finally, Oshima wanted to imbue his character with a 'can do' attitude, inspired by television footage of the then Arkansas governor Bill Clinton. ^ Sheffield, Brandon (December 4, 2009). "Out of the Blue: Naoto Ohshima Speaks". Gamasutra. UBM plc. Archived from the original on July 16, 2015. Retrieved February 15, 2012. The original Nights was chiefly made with the Japanese and European audiences in mind -- Sonic, meanwhile, was squarely aimed at the U.S. market ... [Sonic is] a character that I think is suited to America -- or, at least, the image I had of America at the time. ... Well, he's blue because that's Sega's more-or-less official company color. His shoes were inspired by the cover to Michael Jackson's Bad, which contrasted heavily between white and red -- that Santa Claus-type color. I also thought that red went well for a character who can run really fast, when his legs are spinning. ^ Ashcraft, Brian (December 7, 2009). "Sonic's Shoes Inspired by Michael Jackson". Kotaku. Archived from the original on October 30, 2015. Retrieved December 13, 2009. ^ Horowitz, Ken (December 5, 2006). "Interview: Mark Cerny (Founder of STI)". Sega-16. Archived from the original on October 17, 2014. Retrieved June 20, 2014. Mark Cerny: I heard, I kid you not, that the characters were "unsalvageable," that this was a "disaster," and that "procedures would be put in place to make sure that this sort of thing would never happen again." These "procedures" included a proposed "top ten list of dos and don'ts" to follow when making products for the American market. Additionally, I was told that the marketing group would be contacting a known character designer (I won't reveal the name, but it made me cringe at the time) to make a character that showed exactly what the American market needed. Needless to say, this character designer would have been totally inappropriate for the Japanese market. Not that great for the American market either, I suspect. ^ a b McFerran, Damien "Damo" (March 8, 2007). "Hardware Focus - Sega Megadrive / Genesis". Nintendo Life. Archived from the original on October 7, 2011. Retrieved October 19, 2007. ^ Kent, Steven L. (2001). "The Legal Game". The Ultimate History of Video Games: The Story Behind the Craze that Touched our Lives and Changed the World. Roseville, California: Prima Publishing. p. 381. ISBN 0-7615-3643-4. ^ a b c d Kent, Steven L. (2001). "The Legal Game". The Ultimate History of Video Games: The Story Behind the Craze that Touched our Lives and Changed the World. Roseville, California: Prima Publishing. p. 383. ISBN 0-7615-3643-4. ^ Kent, Steven L. (2001). "The Legal Game". The Ultimate History of Video Games: The Story Behind the Craze that Touched our Lives and Changed the World. Roseville, California: Prima Publishing. p. 382. ISBN 0-7615-3643-4. ^ a b Graham, Lawrence D. (1999). Legal Battles That Shaped the Computer Industry. Greenwood Publishing Group. pp. 112–118. ISBN 1-56720-178-4. ^ a b Cohen, Julie E. (1995). "Reverse Engineering and the Rise of Electronic Vigilantism: Intellectual Property Implications of "Lock-Out" Programs". Southern California Law Review. 68: 1091–1202. Archived from the original on November 2, 2013. ^ Kent, Steven L. (2001). "The Legal Game". The Ultimate History of Video Games: The Story Behind the Craze that Touched our Lives and Changed the World. Roseville, California: Prima Publishing. p. 384. ISBN 0-7615-3643-4. ^ Kent, Steven L. (2001). "The Legal Game". The Ultimate History of Video Games: The Story Behind the Craze that Touched our Lives and Changed the World. Roseville, California: Prima Publishing. p. 386. ISBN 0-7615-3643-4. ^ "Court: Copying Sega's Code Ok an Appeals Court Ruling Protects The Practice of 'Reverse Engineering.'". San Jose Mercury News – via NewsBank (subscription required). Associated Press. September 1, 1992. ^ Stuckey, Kent D. (1996). Internet and Online Law. Law Journal Press. p. 6.37. ISBN 1-58852-074-9. ^ Kent, Steven L. (2001). "The Legal Game". The Ultimate History of Video Games: The Story Behind the Craze that Touched our Lives and Changed the World. Roseville, California: Prima Publishing. p. 388. ISBN 0-7615-3643-4. ^ Cifaldi, Frank (April 30, 2010). "This Day in History: Sega and Accolade Settle Their Differences". 1UP.com. Archived from the original on June 15, 2013. Retrieved December 11, 2016. ^ Langberg, Mike (May 1, 1993). "Accolade, Sega Settle 'Reverse Engineering' Case Out of Court". San Jose Mercury News – via NewsBank (subscription required). Retrieved June 20, 2013. ^ "Television Violence". Hansard. December 16, 1993. Archived from the original on December 3, 2013. Retrieved November 29, 2013. ^ a b c d e f g Kent, Steven L. (2001). "Moral Kombat". The Ultimate History of Video Games: The Story Behind the Craze that Touched our Lives and Changed the World. Roseville, California: Prima Publishing. ISBN 0-7615-3643-4. ^ a b c d Barnholt, Ray (August 4, 2006). "Purple Reign: 15 Years of the Super NES". 1UP.com. p. 4. Archived from the original on April 29, 2013. Retrieved July 13, 2007. ^ Controversy! (podcast). Play Value. ON Networks. Event occurs at 4:51. Archived from the original on June 9, 2012. Retrieved March 19, 2010. ^ "Games That Defined the Sega Genesis / Mega Drive". RacketBoy.com. November 20, 2007. Archived from the original on December 14, 2011. Retrieved March 5, 2010. ^ Burgess, John (January 11, 1994). "Sega to Withdraw, Revise "Night Trap"". The Washington Post. Archived from the original on June 23, 2018. ^ a b c "Weekly Famitsu Express". Famitsu. 11 (392): 8. June 21, 1996. ^ Man!ac Magazine staff (May 1995). "Videospiel-Algebra". Man!ac Magazine. ^ a b c d Kent, Steven L. (2001). The Ultimate History of Video Games: The Story Behind the Craze that Touched our Lives and Changed the World. Roseville, California: Prima Publishing. pp. 508, 531. ISBN 0-7615-3643-4. ^ a b "Sega captures dollar share of videogame market again; diverse product strategy yields market growth; Sega charts path for 1996". Business Wire. January 10, 1996. Archived from the original on May 2, 2014. Estimated dollar share for Sega-branded interactive entertainment hardware and software in 1995 was 43 percent, compared with Nintendo at 42 percent, Sony at 13 percent and The 3DO Co. at 2 percent. Sega estimates the North American videogame market will total more than $3.9 billion for 1995. ^ Kent, Steven L. (2001). The Ultimate History of Video Games: The Story Behind the Craze that Touched our Lives and Changed the World. Roseville, California: Prima Publishing. p. 535. ISBN 0-7615-3643-4. ^ Lomas, Ed (November 1996). "Over 1 Million Saturns In Europe By March". CVG. p. 10. 8 million potential Saturn upgraders! ^ "Sega Unveils 1997 Line-Up for Genesis". Sega of America. June 19, 1997. Archived from the original on June 29, 1998. Retrieved November 12, 2015. ^ "Majesco Sales - Overview". AllGame. Archived from the original on July 27, 2013. Retrieved October 5, 2013. ^ Sponsel, Sebastian (November 16, 2015). "Interview: Stefano Arnhold (Tectoy)". Sega-16. Archived from the original on November 22, 2015. Retrieved November 21, 2015. ^ Schilling, Mellissa A. (Spring 2003). "Technological Leapfrogging: Lessons From the U.S. Video Game Console Industry". California Management Review. University of California, Berkeley. 45 (3): 9. ^ Kent, Steven L. (2001). The Ultimate History of Video Games: The Story Behind the Craze that Touched our Lives and Changed the World. Roseville, California: Prima Publishing. p. 412. ISBN 0-7615-3643-4. ^ a b c Sega Service Manual (Supplement): Genesis II/Mega Drive II. Sega Enterprises, Ltd. 1993. ^ Sega Genesis Instruction Manual. Sega Enterprises, Ltd. 1989. ^ Sega Genesis Instruction Manual (Model 2). Sega Enterprises, Ltd. 1993. ^ a b Sega Service Manual: Genesis II/Mega Drive II. Sega Enterprises, Ltd. 1993. ^ a b c d e f Horowitz, Ken (August 3, 2004). "Genesis Accessory & Peripheral Guide". Sega-16. Archived from the original on October 11, 2013. Retrieved December 4, 2010. ^ a b Beuscher, David. "Sega Genesis - Overview". AllGame. Archived from the original on January 2, 2010. Retrieved October 5, 2013. ^ "Activator Rocks!". Electronic Gaming Monthly (51). EGM Media, LLC. October 1993. p. 60. ^ Kimak, Jonathan (June 5, 2008). "The 6 Most Ill-Conceived Video Game Accessories Ever". Cracked.com. Archived from the original on March 18, 2010. Retrieved July 6, 2010. ^ Harris, Craig (February 21, 2006). "Top 10 Tuesday: Worst Game Controllers". IGN. Archived from the original on January 14, 2007. Retrieved August 7, 2009. ^ "Buyers Beware". GamePro (60). IDG. July 1994. p. 156. ^ "Quadro-Power" (in German). Joker Verlag. March 30, 1994. p. 29. ^ "Mad About Ads". GamePro. No. 84. IDG. September 1995. p. 12. ^ a b Redsell, Adam (May 20, 2012). "SEGA: A Soothsayer of the Games Industry". IGN. Archived from the original on October 12, 2013. Retrieved October 5, 2013. ^ Horowitz, Ken (November 12, 2004). "Xband: Online Gaming's First Big Try". Sega-16. Archived from the original on October 12, 2013. Retrieved October 5, 2013. ^ Buchanan, Levi (March 20, 2009). "Genesis vs. SNES: By the Numbers". IGN. Archived from the original on February 14, 2012. Retrieved January 19, 2011. ^ Horowitz, Ken (December 21, 2011). "Interview: Joe Morici (Capcom VP of Sales)". Sega-16. Archived from the original on January 26, 2016. Retrieved January 20, 2016. ^ "CAPCOM | Platinum Titles". CAPCOM IR. December 31, 2014. Archived from the original on February 8, 2015. Retrieved 2016-01-20. ^ Horowitz, Ken (August 18, 2006). "Interview: Trip Hawkins (Founder of Electronic Arts)". Sega-16. Archived from the original on January 26, 2016. Retrieved January 21, 2016. ^ Boon, Ed (May 5, 2011). "The History of Mortal Kombat – Page 2". IGN. Archived from the original on April 2, 2016. Retrieved January 21, 2016. ^ "SEGA LOWERS PRICE ON HARDWARE, SOFTWARE". Sega Online: Buzz (Press Releases). Sega. June 4, 1997. Retrieved October 22, 2018. ^ a b c d e Horowitz, Ken (March 17, 2006). "Sega's SVP Chip: The Road Not Taken?". Sega-16. Archived from the original on July 27, 2015. Retrieved July 9, 2010. ^ "Sega's SVP Chip to be Sold Separately". GamePro (57). IDG. April 1994. p. 174. ^ "Sega Intros Modular FX Cart!". Electronic Gaming Monthly (56). EGM Media, LLC. March 1994. p. 56. ^ a b c d Beuscher, David. "Sega CD - Overview". AllGame. Archived from the original on April 24, 2011. Retrieved June 27, 2013. ^ a b c d e Beuscher, David. "Sega Genesis 32X - Overview". AllGame. Archived from the original on April 24, 2011. Retrieved June 7, 2013. ^ "Sega's Powering Up the 32X One Strip at a Time". Electronic Gaming Monthly (65). EGM Media, LLC. December 1994. p. 64. ^ a b c Parish, Jeremy (October 16, 2012). "20 Years Ago, Sega Gave Us the Sega CD". 1UP.com. Archived from the original on June 15, 2013. Retrieved December 11, 2016. ^ "Sega v Nintendo: Sonic Boom". The Economist – via ProQuest (subscription required). January 25, 1992. Archived from the original on September 28, 2018. Retrieved October 10, 2013. ^ a b c Birch, Aaron (2005). "Next Level Gaming: Sega Mega-CD". No. 17. Retro Gamer Magazine. pp. 36–42. ^ "Behind the Screens at Sega of Japan". Electronic Gaming Monthly. Vol. 3 no. 29. EGM Media, LLC. December 1991. pp. 115, 122. ^ Marriott, Scott Alan. "Sega Genesis 32X CD - Overview". AllGame. Archived from the original on August 2, 2014. Retrieved July 2, 2013. ^ a b Buchanan, Levi (October 24, 2008). "32X Follies". IGN. Archived from the original on April 17, 2016. Retrieved May 25, 2013. ^ a b McFerran, Damien. "Retroinspection: Sega 32X". Retro Gamer. No. 77. Imagine Publishing. pp. 44–49. ^ a b Horowitz, Ken (February 7, 2013). "Interview: Joe Miller". Sega-16. Archived from the original on December 2, 2013. Retrieved January 10, 2014. ^ a b c d Kent, Steven L. (2001). "The "Next" Generation (Part 1)". The Ultimate History of Video Games: The Story Behind the Craze that Touched our Lives and Changed the World. Prima Publishing. ISBN 0-7615-3643-4. ^ "Sega Saturn". Next Generation. Vol. 1 no. 2. Imagine Media. February 1995. pp. 36–43. ^ "Sega president and CEO also announces immediate availability of Sega Saturn in 1,800 retail outlets in U.S. and Canada". Business Wire. May 11, 1995. Archived from the original on July 9, 2012. Retrieved December 2, 2013. ^ "Let the games begin: Sega Saturn hits retail shelves across the nation Sept. 2". Business Wire. March 9, 1995. Archived from the original on July 8, 2012. Retrieved May 7, 2011. ^ Plunkett, Luke (April 25, 2011). "The Weird And Wonderful World Of The Sega Genesis". Kotaku.com. Archived from the original on November 8, 2013. Retrieved October 16, 2013. ^ a b "New Genesis/CD Systems From Sega". GamePro (56). IDG. March 1994. p. 184. ^ "Sega Packs Sewer Shark with New Sega CD". GamePro (52). IDG. November 1993. p. 261. ^ "CDX-essive?". GamePro (60). IDG. July 1994. p. 158. It's about a hundred bucks more than buying the systems separately, and what you really end up paying for is the sleek, new design and the CDs. ^ Marriott, Scott Alan. "Sega Genesis CDX - Overview". AllGame. Archived from the original on April 24, 2011. Retrieved October 5, 2013. ^ Marriott, Scott Alan. "Sega Genesis Nomad - Overview". AllGame. Archived from the original on April 24, 2011. Retrieved October 5, 2013. ^ "X'Eye-tement". GamePro (62). IDG. September 1994. p. 154. ^ Marriott, Scott Alan. "JVC X'Eye - Overview". AllGame. Archived from the original on April 24, 2011. Retrieved July 2, 2013. ^ Marriott, Scott Alan. "Pioneer LaserActive - Overview". AllGame. Archived from the original on October 19, 2012. Retrieved July 2, 2013. ^ Sheffield, Brandon. "A Casual Rebirth: The Remaking of Majesco". Gamasutra. Archived from the original on November 11, 2013. Retrieved October 9, 2013. ^ a b "Innex Launches Products Containing Licensed Sega Genesis Titles In Time For Q4 Holiday Season". Innex Inc. Archived from the original on July 28, 2011. Retrieved April 25, 2011. ^ Horowitz, Ken (September 16, 2004). "Hands-On: Arcade Legends (Plug-'n-Play)". Sega-16. Archived from the original on July 2, 2014. Retrieved November 17, 2013. ^ "Genesis Emulators". GameSpy. Archived from the original on January 11, 2008. Retrieved July 18, 2010. ^ Retro Gamer staff (2005). "Retro Coverdisc". Retro Gamer. No. 15. Live Publishing. p. 105. ^ "GameTap Sega Catalogue". GameTap. Archived from the original on August 8, 2009. Retrieved July 16, 2010. ^ "Console Classix Sega Genesis games". Console Classix. Archived from the original on June 4, 2008. Retrieved May 15, 2008. ^ Goldstein, Hilary (November 3, 2004). "IGN: Sonic Mega Collection Plus Review". IGN. Archived from the original on July 28, 2012. Retrieved December 4, 2008. ^ Miller, Greg (February 12, 2009). "Sonic's Ultimate Genesis Collection Review". IGN. Archived from the original on August 1, 2012. Retrieved October 6, 2013. ^ Thorsen, Tor (March 23, 2006). "GDC 06: Revolution to play Genesis, TurboGrafx-16 games". GameSpot. Archived from the original on September 3, 2014. Retrieved July 16, 2010. ^ McWhertor, Michael (June 10, 2009). "Sega Vintage Collection 2 games Hit Xbox Live Arcade". Kotaku. Archived from the original on November 8, 2013. Retrieved October 5, 2013. ^ McWhertor, Michael (February 16, 2011). "Sega Genesis Games Come To PlayStation Plus". Kotaku. Archived from the original on December 20, 2013. Retrieved October 5, 2013. ^ "Steam listing: SEGA Genesis Classics Collection". Steam. Archived from the original on November 22, 2013. Retrieved November 27, 2013. ^ "Beggar Prince". Super Fighter Team. Archived from the original on August 3, 2010. Retrieved July 16, 2010. ^ a b McFerran, Damien (July 1, 2011). "Interview: Star Odyssey and The Challenge of Bringing Dead Games Back to Life". Nintendo Life. Archived from the original on October 25, 2011. Retrieved October 3, 2011. ^ Horowitz, Ken (September 5, 2008). "Preview: Pier Solar at Sega-16.com". Sega-16. Archived from the original on November 2, 2013. Retrieved October 16, 2008. ^ Fahs, Travis (October 3, 2008). "Independent's Day, Vol. 5: Pier Solar Flares (page 1)". IGN. Archived from the original on February 21, 2014. Retrieved October 10, 2013. ^ Fahs, Travis (October 3, 2008). "Independent's Day, Vol. 5: Pier Solar Flares (page 2)". IGN. Archived from the original on February 21, 2014. Retrieved October 10, 2013. ^ Narcisse, Evan (August 6, 2013). "Fake Retro Wreck-It Ralph Game Winds Up With Real Sega Genesis Port". Kotaku. Archived from the original on November 19, 2013. Retrieved November 17, 2013. ^ Melanson, Donald (November 13, 2007). "Brazil's TecToy cranks out Mega Drive portable handheld". Engadget. Archived from the original on October 12, 2013. Retrieved January 23, 2007. ^ "Mega Drive Guitar Idol - 87 jogos" (in Portuguese). TecToy. Archived from the original on August 26, 2009. Retrieved July 16, 2010. ^ a b "Cartridge Console With 15 Sega Megadrive Games". Blaze Europe. Archived from the original on August 4, 2014. Retrieved July 16, 2010. ^ Reed, Kristen (August 24, 2008). "SEGA Mega Drive Handheld". Eurogamer. Archived from the original on July 6, 2010. Retrieved July 16, 2010. ^ Sawyer, Jonathan (November 7, 2016). "SEGA Genesis Is Officially Back in Production". Highsnobiety. Archived from the original on November 8, 2016. ^ Liptak, Andrew (April 14, 2018). "Sega announces the Mega Drive Mini". The Verge. Vox Media. Archived from the original on April 15, 2018. Retrieved April 16, 2018. ^ Kohler, Chris. "Sega Will Release The Genesis Mini On September 19". Kotaku. Archived from the original on March 30, 2019. Retrieved March 29, 2019. ^ "Top 25 Videogame Consoles of All Time". IGN. September 4, 2009. Archived from the original on June 23, 2018. Retrieved October 24, 2010. ^ Top Ten Consoles. GameTrailers. April 19, 2007. Event occurs at 4:44. Archived from the original (Flash video) on September 29, 2011. Retrieved September 21, 2011. ^ Reisinger, Don (January 25, 2008). "The SNES is the greatest console of all time". CNET Blog Network. Archived from the original on February 14, 2012. Retrieved September 21, 2011. ^ Sztein, Andrew (March 28, 2008). "The Top Ten Consoles of All Time". GamingExcellence. Archived from the original on May 5, 2012. Retrieved September 21, 2011. ^ Parish, Jeremy (August 14, 2014). "Sega Genesis 25th Anniversary: The Rise and Fall of an All-Time Great". USgamer. Archived from the original on May 27, 2015. Retrieved November 16, 2015. ^ Grubb, Jeff (August 14, 2014). "Sega Genesis genius Tom Kalinske on its 25 year legacy: Battling Nintendo, launching Sonic, and birthing the 'street date'". VentureBeat. Archived from the original on November 17, 2015. Retrieved November 16, 2015. ^ Harris 2014, pp. 227–228, 273–275, 372. ^ "Pssstt! Wanna Buy a Game System?". Next Generation. No. 14. Imagine Media. February 1996. pp. 68–79. Its Welcome to the Next Level campaign for Genesis established it as the system to own ... singlehandedly revolutionizing the way videogames were marketed. It's almost impossible today to even find a videogame ad that doesn't owe something to Sega's shock-tactics marketing innovations.